This is a delicious recipe, resulting in a tasty tart with a wonderful texture. Allow it to cool and then serve it with a side salad for a light lunch. In a large bowl, rub together the flour, butter and salt until it resembles breadcrumbs. Tip the cold water in and then quickly bring the mixture together with your hands. Cling wrap it and put it into the fridge. Meanwhile, place the fish into a saucepan with the milk and some seasoning. Bring it to a simmer and poach the fish for around ten minutes or until tender. Once cooked, remove it from the milk, reserving the milk. Roll the pastry out to around 1cm thick and place it into a 23cm diameter loose-bottomed tart tin. Line the pastry with baking parchment, and then tip some baking beans onto the paper. Blind bake the pastry for 10 minutes at 220C and then remove it from the oven and set it to one side. Beat the eggs and mix them with the reserved milk and the cream. Finely chop the parsley and mix it into the mixture, along with the wholegrain mustard. Season well. Remove the baking beans and parchment from the pastry and then sprinkle the bottom of the tart with the sweetcorn and the flaked fish. 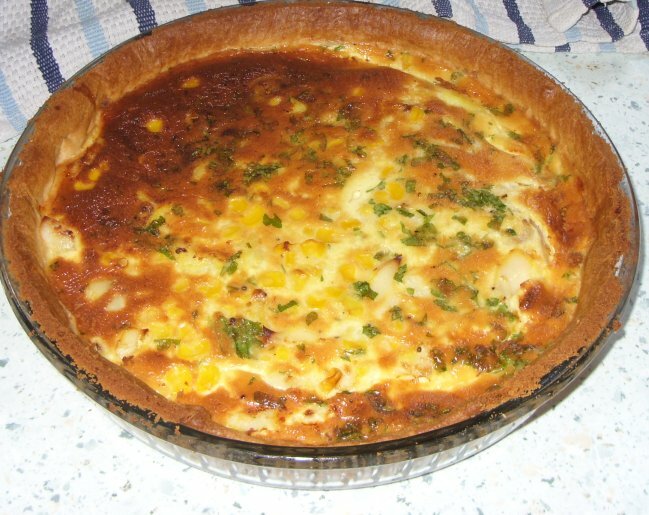 Pour the egg mixture over the fish and sweetcorn and then place the tart into the oven at 220C for half an hour. Once cooked, trim the excess pastry and then allow the tart to cool before cutting it into slices. Summary: This is a delicious recipe, resulting in a tasty tart with a wonderful texture. Allow it to cool and then serve it with a side salad for a light lunch.